The Beverly Hills Post Office. At the beginning of the 20th century, the City of Beverly Hills was a fast growing community, already becoming the preferred residence to the flood of new arrivals from the East. 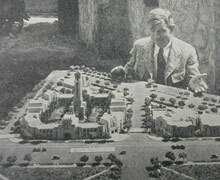 As the community began to take shape, civic projects were initiated in the attempt to create a prestigous new residential city in the West. In 1926 Will Rogers was installed as the honorary mayor of Beverly Hills in front of the already famous Beverly Hills Hotel. This grandiose ceremony was filmed and later screened at movie theaters around the country prompting thousands of letters to be sent weekly to Beverly Hills for ‘his honor’. The need for a permanent mail facility became apparent. The letter initiated a visit and site tour from Washington officials and following the trip, Washington promptly allocated $300,000 for the Beverly Hills Post Office. 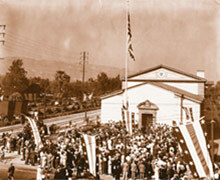 In 1933, the Beverly Hills Post Office was constructed on the site of the former Pacific Electric Railway station. The prominent and prolific Architect Ralph C. Flewelling, designer of buildings at UCLA and USC, in concert with Alison & Alison Architects, received the commission for the Italian Renaissance Revival style building. Artist Charles Kassler was commissioned to decorate the walls of the interior Grand Hall with fresco murals depicting the creation of the mail service and views of modern life during the Depression. These eight lunette murals were funded under Franklin Delano Roosevelt’s WPA program and are one of the only two remaining WPA frescos in the entire California Federal building system. Painted as homage to the WPA program, the six murals on the north and south walls depict laborers and artisans working on WPA projects, collecting their wages and purchasing groceries at an outdoor market with their families. Flanking these vignettes of everyday life are two additional Kassler frescos representing the history and future of the postal service, the Pony Express and airmail. The Post Office officially opened in 1934 and was dedicated in 1936 under the Franklin D. Roosevelt Administration. Over the decades, the Beverly Hills Post Office took on great significance as the cornerstone of the city, and an architectural landmark. The famous citizens of Beverly Hills were spotted daily at the Post Office, symbolizing the fact that this was an extraordinary building in an extraordinary town. In recognition of its historic stature, the Beverly Hills Post Office was listed on the National Register of Historic Places in 1985. Eventually, the Post Office services outgrew the building, and in 1993, the Postal Service declared the historic building “surplus property”. 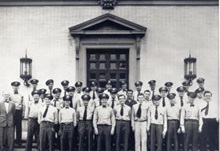 When postal operations moved to a new facility, then Mayor Vicki Reynolds and city leadership grasped the opportunity to acquire and preserve the landmark building. A group of civic and business leaders became the Beverly Hills Cultural Center Foundation, a nonprofit organization dedicated to the adaptive reuse of the historic Post Office for a cultural venue, continuing the building’s long tradition of public use. The Beverly Hills Post Office is now poised to become a new national landmark as it begins life as the Wallis Annenberg Center for the Performing Arts. Architect Ralph C. Flewelling and artist Charles Kassler would be honored that the building they so lovingly constructed long ago is being fittingly preserved and modernized as a cultural destination for audiences of all ages.